On Sunday, September 23rd, the Women of Cinematic Arts board was honored to host the WCA Relaunch Party at a board member’s home in Larchmont. At the casual event, WCA members gathered with friends, partners, and children to celebrate the new direction of the organization. 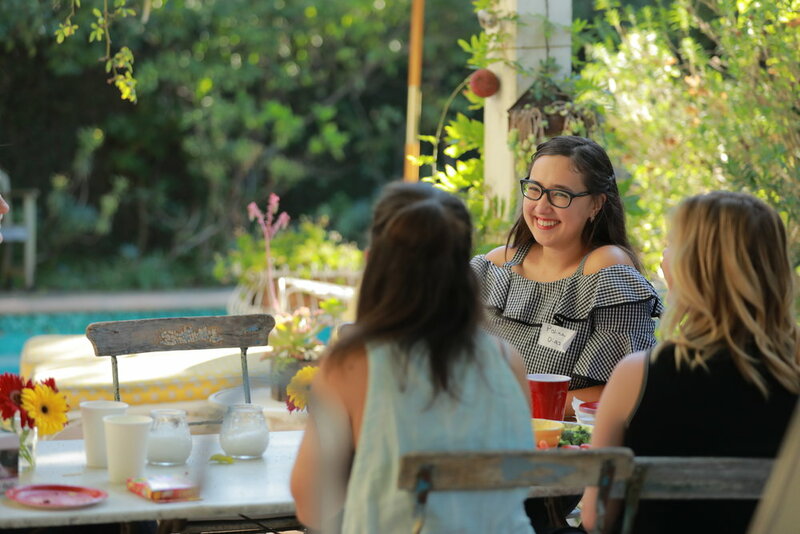 Guests chatted and bonded over sangria and snacks, allowing new members to learn a bit more about the other amazing women who make up this community and serving as a homecoming for returning members. The party ran a little over the set three-hour timeframe as everyone enjoyed connecting with one another. No one wanted to wrap! That connection is the reason for the Relaunch. The Women of Cinematic Arts was founded in 2005 in order to unite the alumnae of SCA. Throughout the years, we’ve hosted panels, workshops, mixers, and brunches, but in recent years the largest focus of our community has been a digital, listserv presence. However, there’s a desire for even more opportunities for in-person connection, and a recognition of the power of female camaraderie and support. In 2017, the WCA board got together and realized that now, more than ever, we want a space to connect with other women in the industry - both new graduates and those with more experience in the field. We want to be a part of a sisterhood, and enable SCA graduates to engage with one another in a meaningful way. And so, the idea to relaunch the Women of Cinematic Arts - its mission, its model, its value to members - was born. The Relaunch served as a celebration to kick off a new chapter in WCA. Guests were excited for an opportunity to connect with other women in a setting that was really designed for women in the industry. The format - in a place where they could bring their friends and families and talk about the challenges of being a woman film and television - encouraged guests to relax and truly connect with one another. Our hope is that events like these will foster a strong community by providing less traditional formal networking events, and more events that feel like a relaxed gathering of new and familiar faces, discussing life in the industry. Moving forward from the Relaunch Party, look out for updates on new programming. The board is working on keeping old favorites, like October Brunch Month, but also introducing volunteer and mentorship programs, and screenings throughout the year. If you have ideas for events, please let us know! And to make sure that you can be a part of this exciting new take on the community, be sure to register as a member of USC’s Women of Cinematic Arts official alumnae organization. Follow us on Instagram, Facebook, and Twitter for updates about upcoming events and news about the organization.